This is a book edited by 3 colleagues from the Department of Social Work at Umeå University, a city in the North of Sweden and although some of the contributors come from Sweden, there is research and contributions from Austria, Denmark, Finland, Hong Kong, Italy, Norway, Poland and the UK. As a result, the book takes an explicitly European (rather than global) approach to social and caring professions and there is significant focus on Scandinavian welfare practices. The book is divided into 4 parts to look at the current ‘key aspects of social and caring professions’, and the book explicitly aims itself at the ‘caring professions’ and includes physicians, physiotherapist, elderly care workers, psychologists, family assistance, community workers, psychiatrists and job centre offices, although its not until Chapter 9 that a profession other than social work (physiotherapy) comes under the spotlight. The first part of the book concerns welfare professionals’ identities as created by their education, work experience and supervision. In this section chapters unpick ideas around professional identity, including relationship-based practice, evidence-based practice in the context of management, politics and economics using evidence from Danish, English and Norwegian practitioners. This section begins by outlining the audit culture, the medicalisation of social problems and the relationships with service users and patients. Despite the opacity of some of the language e.g. “Agency and its link to the expression of professional identities can also be seen as a central element in theoretical understandings of supervision, in reaching meta-theoretical understanding of the functional mechanisms of supervision.” (p. 58), there is exploration of supervision and decreasing autonomy in the culture of New Public Management (NPM) practices – shorthand for privatisation and managerial-technicist versions of welfare work. The second section of the book concentrates on the regulation and state-control of the professions in the context of audit and accountability governance. The three chapters in this section focus on the UK, Sweden and Poland. Both the UK and Polish chapters (and a later chapter) provide some interesting developmental histories of social work in each country and the battle between improving the status of the profession and de-professionalisation. The third section of the book attends to the themes of collaboration, conflict and competition in multi-professional services. Chapters focus on professional collaboration in Norway, Sweden and Finland, how professionals in health and social care negotiate boundaries when working with communities, children, families and drug users, and includes a history of the development of physiotherapy in Norway. Chapter 12 considers the challenges of local authority community work in Poland, which, while “not a total failure, was not a total success either” and will be familiar to scholars of community work. The final section of the book addresses the question of how social and caring welfare professionals make decisions in the context of evidence-based practices (EBP). Chapters discuss the ‘fuzzy realities’, uncertainties and complexities of practitioners (including GPs) managing risk with examples from Denmark, Sweden, Italy and Austria. The chapters are confidently linked to EBP and EB research and illustrated by ‘troublesome case’ vignettes. 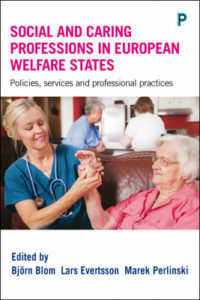 This section ends with a chapter by the editors which considers the future trends and challenges for social and caring professions in European welfare states. Inevitably in a collection such as this, chapters varied in quality. There were recurrent themes such as the rise of welfare costs, NPM, EBP, the loss of professional autonomy, the increase in the audit culture, the dilemma of simultaneously improving performance while staying on budget and decentralisation. This is a book with many worthwhile things to say about how welfare is and could be delivered. If the aim of the book is to “provide new insights” into the practices of social and caring professions, then that is principally achieved by sharing empirical research and in making national comparisons. Dr Stephen Jordan is a lecturer at the University of Essex and editor of the book review section of IFSW. Stephen qualified as a social worker in 1988 and has worked as a lecturer for the University of Essex since September 2014. Stephen is currently writing a book about the uses and abuses of humour in social work.